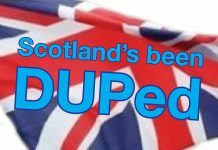 Divide and rule has always been a strategy used by British politicians, and Mrs May is no different. Finding it difficult to move the EU from its long-held position regarding Brexit, Mrs May is attempting to have discussions with individual member states in the hope of obtaining backing for her position and assistance in moving the stance of what she sees as a stubborn and intransigent EU that is unwilling to bend to her will. So Mrs May is sending members of her cabinet on visits to EU countries, not to enjoy a holiday revelling in sand, sea, cheap booze, and a new culture, but to persuade them that her White Paper on the future relationship between the UK and EU is the sensible, indeed the only way forward, despite the EU shaking its head over her proposals, questioning whether the plans could work without causing extra bureaucracy, and reiterating that the EU would not run the risk of weakening its single market. EU comments have been muted as they recognise the muddy hole Mrs May is scrabbling around in and would like her to be able to climb out of it so that a workable plan can be negotiated for the UK leaving the EU. Others commenting have been more forthright, the politest being that the White Paper is an unworkable compromise. Meanwhile, Doug Gurr, the head of Amazon in the UK, warned of potential “civil unrest” in the event of ‘no deal’, while Foreign Secretary Jeremy Hunt planned to meet his German counterpart Heiko Maas, anxious to tell him the EU must show “more flexibility and creativity” to avoid what he calls a “no deal by accident scenario”, whatever that is. Deal or no deal, a post-Brexit UK is going to be desperate for trading partners and free trade deals, and there will be pressure on the Tories, who have long boasted how easy these would be and how great they will be for UK prosperity, to produce the goods. We were assured deals could be done in the blink of an eye, that we’d hardly realise we had left the EU: deals so beneficial they would assuredly take the place of the 70 or so trade arrangements we have (or would soon have benefitted from) through our EU membership (750 Treaty agreements overall). 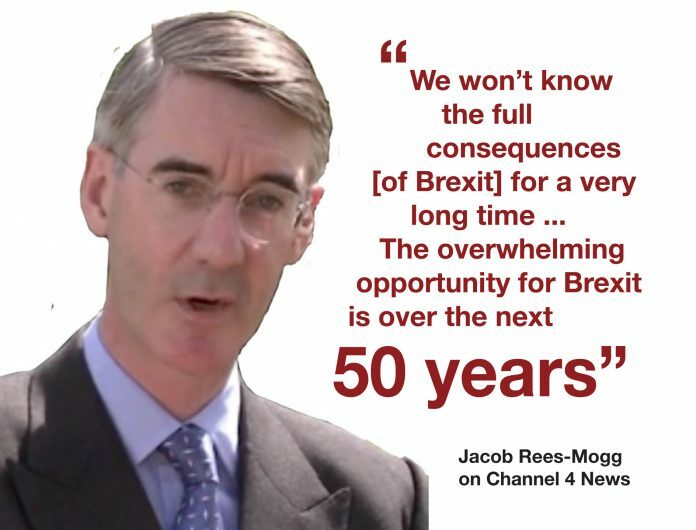 However in a recent interview Jacob Rees-Mogg indicates the benefits may be somewhat longer in materialising. “We won’t know the full economic consequences [of Brexit] for a very long time…The overwhelming opportunity for Brexit is over the next 50 years”. So most of us around now will see no, or little benefit from Brexit, more likely the opposite, though our kids and grandkids just might. Hmmm. Personally I’d rather opt for the benefits of EU membership that we enjoy at present. Jam today please rather than jam in fifty years. It appears work has already been done on what some of us might have considered elusive trade deals with other countries. In a recent speech to the FSB (Federation oF Small Businesses), International Trade Secretary Liam Fox announced public consultations ahead of negotiations on future trade agreements. The agreements sought are with the US, Australia and New Zealand, with the UK potentially seeking accession to the Comprehensive and Progressive Agreement for Trans-Pacific Partnership (CPTPP). The CPTPP is a signed, but not-yet ratified, trade agreement between Australia, Brunei, Canada, Chile, Japan, Malaysia, Mexico, New Zealand, Peru, Singapore and Vietnam, with the eleven countries accounting for 13.4 percent of global gross domestic product ­–­ the reason desperate Britain wants to join for a slice of the action. The CPTPP formerly TPP (Trans-Pacific Partnership) is the latest embodiment of the agreement the US withdrew from because it wasn’t sufficiently favourable to the US. It incorporates most of the TPP arrangements with the exception of 22 provisions favoured by the US but opposed by other countries.. The agreement was returned to life in 2017 and signed under its new name in March 2018. It will come into effect 60 days after ratification by at least 50% of the signatories, but so far has only been ratified by three (Mexico, Japan and Singapore). So perhaps not quite the shining trade star anticipated by the Tories. One of the primary concerns regarding TTIP was the perceived lack of transparency, along with the investor-state dispute settlement (ISDS) which could overrule governments and the potential impact of the agreement on public services, specifically the NHS. Meantime, a free trade agreement between the European Union and Latin American bloc Mercosur (Argentina, Brazil, Paraguay and Uruguay – the world’s fourth largest trading bloc) is close to being concluded, perhaps by early September. In terms of tariff reduction, it could be the bloc’s most lucrative trade deal to date, with the savings potentially three times greater than for deals with Canada and Japan combined. Despite the potential benefits of CPTPP, and Liam Fox’s brave words, it is said no amount of trade deals with other countries around the globe will come anywhere near compensating for our loss of trade as part of the European Union. Leaving the Customs Union and the single market means we lose the equal access that we at present have to 60% of our trade – nearly half directly with the EU with another 12% or so through EU preferential trade deals. That’s a big whack to make up, especially when you add in on top of that the newly signed EU–Japan deal, billed as the world’s largest bilateral free trade deal which will in time eliminate about 99% of tariffs on Japanese goods, including on cars. A free trade deal with America is portrayed by the Tory government as the holy grail of our successful new post-Brexit future, though as we already have a strong trading relationship with the US any deal is likely to have only a minimal effect on our GDP. There is little if any evidence that new free trade agreements would compensate for the hit from leaving the EU single market and customs union. The Institute for Fiscal Studies has said “simple arithmetic” and “a basic understanding of trade” show the gains from such FTAs are likely to be small. But to return to those public consultations ahead of negotiations on future trade agreements announced by Liam Fox. Perhaps we should wonder just how public those consultations will be, and exactly what form they will take, for Liam Fox has deeply anchored links with several of the think tanks looking to “hash out an ideal” US-UK trade deal. Be in no doubt that the Westminster Tory government is sympathetic to many of the US trade deal aims. Recently, before his resignation Boris Johnson held a launch event in the Foreign Office for the Initiative for Free Trade think tank, founded by Tory MP Daniel Hannan. The IFT claims to be Britain’s only research institute dedicated solely to trade policy. IFT’s official aims are to “recapture the moral case for open commerce” and promote free trade. The IFT’s recently leaked prospectus (now removed from its website) makes for interesting reading, detailing plans for an “unprecedented” coalition of right-wing libertarian and hard-Brexit think tanks to hold “shadow trade talks” that will “hash out an ideal” US-UK trade deal. The prospectus US – UK Shadow trade talks and an “ideal FTA” states that leaving the single market and customs union is the UK government’s stated policy, “since it is considered the best reflection of people’s reasons for voting to leave the EU in the 2016 Referendum. In the General Election of June 2017, over 84 percent of Brits voted for parties whose manifestos explicitly supported leaving the EU customs union and single market. The UK’s non-EU trading partners can therefore be certain of the UK’s freedom to negotiate trade deals after Brexit. Highlighting the economic gains of such deals might even help convince sceptics that this is a good thing!” Sounds a bit as if Boris wrote this. The public consultations flagged up by Liam Fox and the Department of International Trade appear to be somewhat late in the day as consultations have already been widely undertaken. The document explains how the Department for International Trade (DIT) was created in July 2016, in its first year establishing a global workforce of over 3,100 people, and setting up 10 working groups with 15 countries. In order to kick-start the UK’s bilateral, regional and multilateral trade relationships, in its first year DIT ministers visited 47 markets on more than 90 international visits. So this is a costly exercise from which the UK public has yet to see any returns, or even a hint of any returns. The IFT aims for a liberal trade regime, and embraces a vision of other countries, such as Canada, Norway, and Iceland, joining to form a North Atlantic Free Trade Area. To bring about this new free trade area, and firstly and in particular a free trade deal with the US, the government is being sidelined in favour of right-wing think tanks. 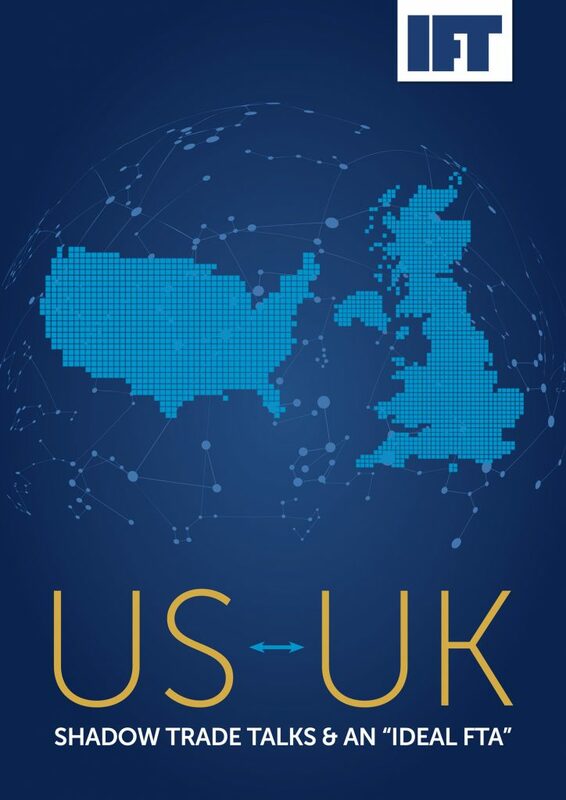 The Cato Institute’s Herbert A. Stiefel Center for Trade Policy Studies is drafting an ideal US-UK FTA trade document which will form the basis of the US-UK shadow trade talks at which each participant will represent a major US or UK free-market or conservative institute. The prospectus paper acknowledges it is unprecedented for all these organisations to come together to work on a joint blueprint but says the final document will be all the better for it and will have more impact. All these are right-wing, libertarian, hard Brexit, well financed, well connected and influential think tanks, actively seeking the best for themselves though not necessarily for the rest of us, deciding on our trade strategy and terms instead of our elected government who will no doubt be bulldozed into agreement with their proposals, or enable their passing without any democratic scrutiny whatsoever in today’s executive run parliament. Any hindrance, any unwanted protection will be squashed underfoot like bugs on the pavement without a second thought. “The IFT’s website boasts of its’ ‘extensive networks within governments’, which it will ‘use to promote new trade agreements and to make sure that they focus on mutual recognition. 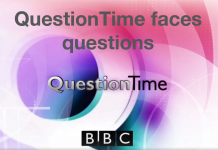 Next articleSecond helping or second referendums?